A standard pair of cymbals is usually 18 inches in size and has a quick response to vibrations. These are generally used when a cymbal part has a combination of loud and soft strokes and rhythmic passages. The French type or sound of cymbals has a quick response and a fast decay. These cymbals are thin and have lower overtones present. The German type or sound of cymbals has a slower response and slower decay. These cymbals are thicker and have a more brilliant sound. A smaller pair of cymbals should be on hand in order to have better control during softer, more delicate passages. However, smaller symbals create a thinner texture than larger ones. The index finger and thumb curl around the strap nearest to the bell of the cymbal. The strap lays in the palm and the other three fingers wrap around the strap just like a snare drum grip. Another option is to lay the middle and ring fingers in the strap with the pinky on the outside. The top cymbal should hang down like a suspended cymbal, but at a slight angle. The bottom cymbal should face upward at a slight angle, resting on the knuckle of the hand. The two cymbals should set naturally at a slight angle to each other. 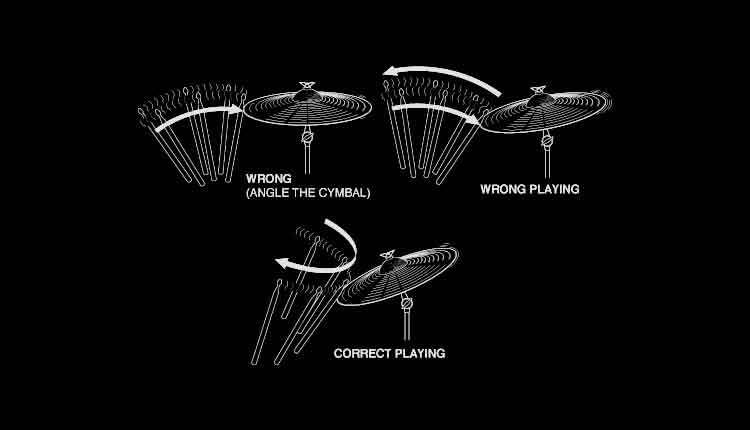 The top cymbal is then dropped down onto the bottom cymbal. Both cymbals should be in motion for the best timbre. The impact causes the cymbals to pull apart from each other. To avoid air pockets (no sound), remember to drop the top cymbal straight down and not at a glance. Use a general crash stroke, but reduce the angle to about 45 degrees. The cymbals should be kept close together to be ready for the next crash. The cymbals should be held about 5 degrees to the left of straight up and down. Separate the cymbals with the edge of the bottom cymbal above the edge of the top cymbal. Drop the top cymbal by pushing downward with the thumb and forefinger, then pull apart after impact. Bring the cymbals into the upper part of the body and arms. A forte-piano effect can be accomplished by dampening only one cymbal. The dampening rules for inconsistent note values on bass drum also apply to cymbals. Some parts indicate a need to dampen, although the tempo and note values may not allow for this. Suspended cymbals are usually smaller and thinner than crash cymbals. The standard size, which respond very quickly when struck with a mallet, is usually 16″ to 18″ in diameter. Used for very soft and delicate passages. Quickly respond for crescendos and diminuendos. Used for a more sustained sound. Suspend the cymbal by its strap from a boom stand. This allows the cymbal to vibrate freely. The cymbal may also be placed on a regular cymbal stand, which allows for the most control. Soft wound yarn or cord mallets allow the cymbal to respond quickly and bring out all the overtones. When a composition calls for a timpani mallet, always substitute these instead. Other implements include snare drum sticks, triangle beaters, brushes, etc. Rolls with snare sticks should be played as a buzz roll on the edge of the cymbal. Strokes are always made on the edge of the cymbal, unless otherwise specified in the score. A roll can easily be controlled by placing the mallets on the edge at approximately 4 and 8 o’clock. Additional effects call for different areas of the cymbal to be struck, scraped, or rubbed by triangle beaters, coins, a bass bow, etc. A sizzle effect can be obtained by holding a thin triangle beater on the cymbal and then striking the cymbal with another mallet. Muffling is used to articulate rhythmic figures. For slow tempos, use one hand to muffle and one hand to play. For fast tempos, when both hands are needed to play, use your midriff to muffle. Hold the cymbal with the thumb and index finger. Let the fingers wrap around the strap and push the top cymbal into the attached cymbal. For loud playing, use a larger cymbal on top. For softer playing, use a smaller cymbal on top. Bring the top cymbal into the chest. Grab the attached cymbal with the right hand. Dampen or muffle the bass drum with the right knee.